We applaud your investment in the next generation and consider it an honor to serve you in your vital mission! LifeSmart’s curricular resources are used in schools around the nation and in Asia to offer wisdom and strategies practiced by respected leaders. Our innovative work is used in leadership, life skills, at-risk, FCS, CTE, and related programs to build leadership and life readiness skills. Our What I Wish I Knew at 18 resources address 23 of the Search Institute’s 40 Developmental Assets® , fulfill over 50 of the National Standards & Competencies for Family & Consumer Science, and address many workplace readiness skills. 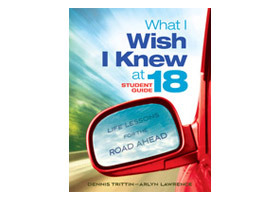 What I Wish I Knew at 18: Life Lessons for the Road Ahead is your student’s guidebook to a successful life. Conversationally written, it shares the principles and strategies of honorable leaders. Its 109 life success pointers build a leadership foundation in areas like character, relationships, communication, productivity, and handling adversity, while offering essential wisdom for life decisions involving college, career, family, and finances. It serves as the curricular text for the What I Wish I Knew at 18 Leadership and Life Skills course. 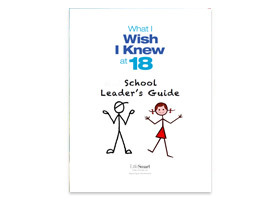 What I Wish I Knew at 18 Student Guide (available in both Standard/Universal and Christian Editions) takes the book’s 109 success principles into an innovative, engaging 49-lesson course. It serves as a student workbook and facilitator guide, complete with ready-to-implement lessons for students to learn and practice success strategies through role-playing activities, self-assessments, relevant discussion questions, and more. Most schools purchase classroom sets of the book and guide and use the resources as a core program or as supplements to other curriculum. Leaders’ Guide (High School and Middle School) – Free download on our website! One of the greatest things about What I Wish I Knew at 18 is that you don’t have to be a rocket scientist to teach it. Nor do you need to be a psychologist, a therapist, a child development expert or any other kind of expert! You simply need to be someone with the desire and relational skill to help teens learn the foundational principles necessary for a successful launch into adulthood. All the tools you need are in the curriculum itself and in this free downloadable leaders guide, where you’ll find lesson planning tools, ideas for expanding the curriculum, and much more. Parenting for the Launch: Raising Teens to Succeed in the Real World is a guidebook for raising “real world ready” future adults and a bridge builder between schools and the parent community. It helps parents set goals, develop leadership and life skills, build an enduring relationship, and position teens for a successful transition into adulthood. It’s filled with practical wisdom and strategies to parent with purpose and let go with confidence! Ideal for individual and group use. Preparing Your Child for College and a Career is a DVD of a 60-minute talk by Dennis Trittin to parents at Appleton West High School in Wisconsin. 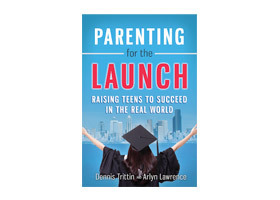 It shares strategies to confidently prepare teens for a successful launch into adulthood. Viewers learn how to develop leadership skills, identify their teen’s unique assets, build an enduring relationship, and position them for success in college, career, and life. A great resource for parent groups! 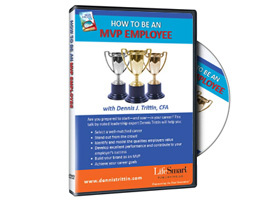 How to Be an MVP Employee is a DVD of a 45-minute talk by Dennis Trittin to students at Appleton West High School in Wisconsin. It uses examples and skits to reveal four strategies to succeed in the workplace: selecting a well-matched career, modeling MVP qualities, delivering excellent performance, and contributing to their employer’s success. A great career readiness tool to prepare students for workplace success! Time for Excellence is LifeSmart’s blog. It offers nuggets of inspirational and practical life wisdom for parents, teens, educators, and mentors. It includes great conversation starters for the classroom. Follow us at www.lifesmartblog.com. We would love to serve you and hear from you. We can be reached on Facebook and Twitter, via the Contact section of this site and at www.parentingforthelaunch.com. Best wishes to you in developing inspired leaders! Want to see more? 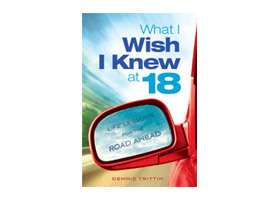 View our convenient book widget to watch our book trailer and read a sample chapter of What I Wish I knew at 18. Also, check out our curriculum page with free sample lesson plans from our Leadership and Life Skills curriculum. Discounts are available for bulk orders by calling 920-319-3169.